UVI’s rainbow–hued reverb plug–in is designed to help you instantly find the right ambience for your mix. 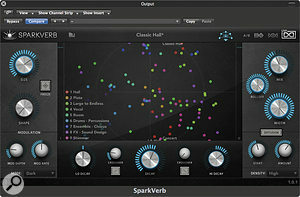 With Sparkverb, UVI promise us a “cutting–edge algorithmic design” with “modern and innovative controls” that “breaks the boundaries of contemporary reverbs”. This is certainly fighting talk, but does their multi–platform reverb plug–in back up their claims? This is not a cheap plug–in at $199, but everything about Sparkverb gives an impression of quality, and a good deal of thought has obviously gone into its design. It has a sleek, modern interface, uncluttered and straightforward, with just one page of controls providing access to all the reverb parameters. Clicking on any knob brings up a brief description of its function below the centre of the screen. The controls remain the same regardless of which type of reverb you load from the menu, so once you gain familiarity with the layout it is fast and easy to use. Sparkverb is also able to work in surround, and will automatically reconfigure its inputs and outputs when initialised in a 5.1 situation. 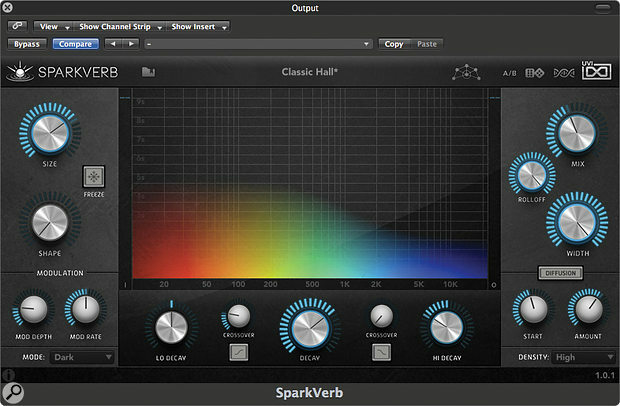 Sparkverb is available in all common plug–in formats on Mac OS and Windows, including 64–bit AAX for Pro Tools 11, and can be authorised to an iLok key or to a designated computer. For those who like to try before they buy, UVI offer a 15–day demo period. Whilst waiting for the plug–in to download I took the unusual step of watching the online tutorial (www.youtube.com/watch?v=wC0–3rZWbMY), which gives a very clear demonstration of how Sparkverb works. Having downloaded the plug–in I fired up Logic and tried it out on a few Apple Loops to get a feel for it before trying it on a session. The interface is as easy to understand in practice as it appears, and very intuitive. It is also nicely colour–driven! The screen is divided into four areas. The centre of the screen is dominated by a multi–coloured representation of what the reverb is doing, represented by frequency on the ‘X’ axis — colour–coded from red to blue — and time on the ‘Y’ axis. The taller a patch of colour, the longer the reverb at that frequency, making for an easily comprehensible visual perspective of what the reverb is doing. The X–Y screen can also respond to the mouse: you simply click and drag to tweak the response of the reverb. For instance, you can easily increase the low–end component of the reverb by grabbing it with the mouse pointer and pulling it up. This simple control is effective and requires no knowledge of the parameters being adjusted — you just drag the colours until you get the sound you are after! To the left of the X–Y panel are the controls for the size and shape of the virtual space, as well as a button marked Freeze. The Size parameter not only varies the perceived dimensions of the room, but also adjusts the pre–delay and early reflections to match the size of room chosen. Shape changes the room proportions and is stepped in percentages from zero to 100 percent. Below this are depth and rate controls for modulating the signal, which can subtly add movement to the reverb tail if used in moderation, and add vibrato–style effects at higher settings. A mode button gives you the choice of three settings: Lo–fi, Dark and Bright. These change the nature of the room simulation by using differing algorithms. Bright employs modern high–quality interpolation which preserves high frequencies better, while the Dark and Lo–Fi modes use progressively more ‘naive’ algorithms that damp the high frequencies more, and in conjunction with modulation, add noisy artifacts that recall classic vintage hardware. The bottom of the centre screen provides a Decay control that adjusts the overall reverb time between 0.04s and 50s, depending on the size of room chosen. All the parameters interact, so decreasing the size of the room will decrease the decay time accordingly. To the left and right of this are the low and high decay controls, which introduce shelving or low/high–pass filters at the selected frequency to adjust the colour of the reverb decay. Any adjustments are shown as increases or decreases of colour in the main display. The right of the screen includes a global wet/dry Mix knob, a Roll–off control which attenuates high frequencies, a knob that adjusts the perceived width of the reverb, and controls for the density and diffusion pattern of the reflections that make up the reverb. The only not–so–obvious controls are along the top bar of the plug–in, and include access to the various factory and user presets. All the factory presets are what you would expect, grouped into useful categories from halls to plates, drums to vocals as well as my favourite moniker ‘Large to Endless’. An A/B switch will temporarily store a preset and restore the previous for comparisons. A pair of dice indicates a feature that adjusts all the parameters in a random fashion, and next to this a helix symbol indicates a ‘mutate’ function that shifts all the parameters slightly to throw up new versions of the current setting. Sparkverb is easy to use and well thought–out, but how does it sound? Well, it’s good! It has depth and richness when needed, but also a nice detailed top end. The decays are smooth and taper nicely even on extreme settings. No matter what sound I threw at Sparkverb it handled it reasonably well. It has a comprehensive selection of presets and covers all genres well. It is flexible enough to tweak to where you need it, and this can be done quickly. What I found particularly appealing was the speed with which I was able to shape the sound. I do a lot of work that needs to be completed in a short time. Loading and auditioning reverbs takes time. Quite often I know what sound I am after, and compared with trying to design that sound using UA’s RealVerb or Waves’ Renaissance Verb, I have to admit to finding Sparkverb easier and faster to use. Sparkverb provides a broad and colourful pallete from which to choose and blend a sound quickly, whilst producing great, professional results. Some might look at the interface and assume that it’s oversimplified, especially considering the not insignificant price tag, but I think that the design is actually far from lazy. It is intuitive, fast, easy to use and the colour display speeds up workflow by providing simple visual feedback. It is also CPU–friendly, so you can easily load many instances into a project. I can see Sparkverb becoming my first port of call for many situations, the only obvious exception being where I need to recreate the sound of a vintage device such as a plate or spring. 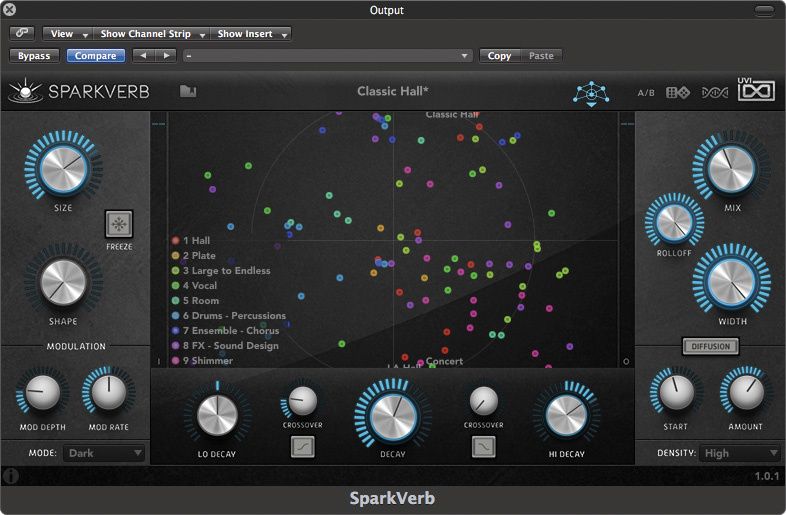 As a ‘go–to reverb’, however, Sparkverb is a versatile all–round performer. One of Sparkverb’s most distinctive features is a button that looks like half a spider’s web and is described as the ‘preset voyager’. Press it and the screen changes to a series of coloured dots not unlike an astral map, on which all the presets are marked like stars. Presets that are clustered together have similar sounds, even though they may have very different origins. This is a novel and useful way of discovering new associated sounds. I found it surprisingly helpful, and it often let me choose different types of reverbs than I would normally expect to use to obtain a certain sound — although sometimes I did question the alleged similarity between adjacent presets! Fast and easy to use, with high–quality sounds. Novel ‘preset voyager’ screen prompts you to explore new sounds. Intuitive X–Y screen gives great visual feedback and control. Expensive compared with some reverbs. Sparkverb’s innovative interface makes it easy to choose and shape the right reverb for your song.